The Compamia Ares Square Dining Set in Black features all-black chairs and tables that are sleek in design and substantial in comfort. 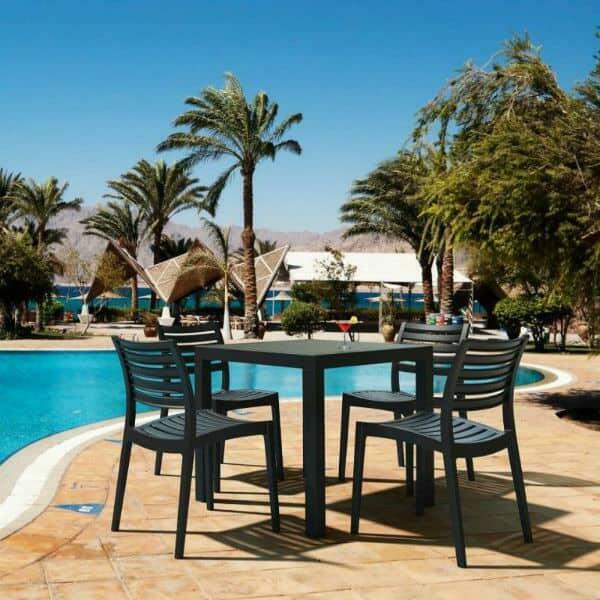 The hot topic in the world of outdoor furniture is sustainability, both for the environment and for furniture itself. This discussion has lead to innovations in materials, eventually the creation of the polypropylene resin that is used on the Ares Dining Set. The resin polypropylene material is engineered to withstand all sorts of elemental and human exposures. The Ares Square Dining in Black is made to resist UV exposure, extreme hot, extreme cold, suntan oils, sunscreen, chlorine, salt and more. Thus, fret not about placement. Consider poolside location, certainly! The Ares Square Dining comes in multiple colors and variations. Browse the Family Leisure selection of Ares sets by Compamia until you find one that meets your every need.